Your well-stocked cleaning cupboard full of all kinds of chemicals could be missing its star player – vinegar. Yup, this kitchen staple is one of the most versatile and affordable household cleaners but some of us are yet to learn how to clean with vinegar. If you are cleaning your home, top to bottom, there are few jobs that vinegar can't do. Looking for a powerful degreaser? That's vinegar. Antibacterial properties? Vinegar! Something to clean mould or mildew? You got it... vinegar. 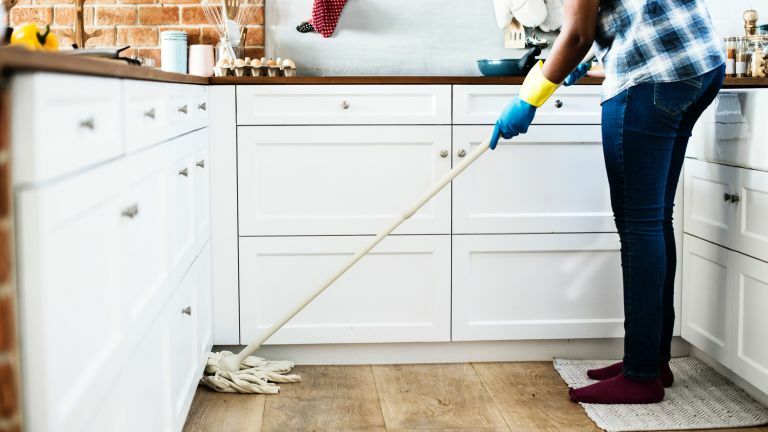 One person who certainly is familiar with using vinegar to clean her home is Queen of Clean, Lynsey Crombie (you might recognise her from Channel 4's Obsessive Compulsive Cleaners) and she is here to share her top tips for getting the most out of this acetic wonder. From cutting through grime to banishing mould, see Lynsey's top 15 ways to use vinegar for cleaning, as featured in her new book How to Clean Your House and Tidy up Your Life. Take a look at the Real Homes pick of the 50 best cleaning products for your home, too. Which vinegar should you use to clean? Before you go dousing all of your stuff with malt vinegar, hold on. Lynsey recommends using white wine vinegar but any clear or colourless vinegar is best. You can buy basic white vinegar for less than a pound at your local supermarket, but if you have time look online for bulk deals on catering bottles to get more bang for your buck. The same applies for bicarbonate of soda which can be bought in a 5kg tub for just over £10 (the same would cost over £30 if you bought the small tubs for home baking). Use our guide to cleaning with bicarbonate of soda for LOADS more tips. If you have room to store four large bottles of vinegar, this deal is totally worth it. You can also use vinegar as an eco-friendly weed killer, so stock up! I do this monthly and this trick has never let me down. Simply fill the kettle with half water and half vinegar and leave for 30 minutes. Once the time is up, boil the kettle then empty and rinse thoroughly. This will keep limescale at bay and eliminates the need for harsh chemicals. You can also try this trick on your coffee machine! This is a task that you need to add to your monthly cleaning schedule. When combined with bicarbonate of soda, white wine vinegar can get rid of those nasty sink odours and keep your drain free of slime and gunk. The mixture will break down fat and food residues, leaving your pipes blockage free and your drains smelling fresh. Afterwards, make sure you rinse well with freshly boiled water (if you have plastic pipes, rinse with cold or warm water). It takes no time at all and makes all the difference. See more on how to unblock a sink in our guide. Fill a microwave-safe bowl with 120 ml/1/2 cups vinegar and 250 ml/1 cup water, place in the microwave and put on a high heat for five minutes. Leave it in the microwave while it cools. Afterwards, you can easily wipe down the inside of the microwave and, as if by magic, those nasty odours will have miraculously disappeared! Our full guide has more tips on cleaning a microwave. Mix four teaspoons vinegar into a half-filled washing-up bowl of warm water and use the solution to to wipe down your refrigerator’s interior, including the shelves, walls and even food packaging, if necessary. Your refrigerator will be clean and fresh-smelling without the need for harsh chemicals that could contaminate food. Find more about the best ways to clean a fridge in our guide. Vinegar helps remove bacteria and pesticide residues from fruit and vegetables. Mix three parts water to one part white wine vinegar, and dispense in a spray bottle. Rinse clean. Add a mixture of water and vinegar to a saucepan and boil on the hob for 15 minutes to get rid of any nasty odours in your kitchen. This is particularly good after cooking. Use our guide to find out more about getting rid of household smells – with vinegar and other nifty store cupboard standbys. A great pre-dinner-party tip to remove marks from your glasses is to submerge them in a mixture of water and vinegar. Remove and leave to dry naturally, then wash again. Find more clever kitchen cleaning hacks in our guide. Limescale and hard water stains can be a real pain to remove and many of the cleaning products on the market just don’t cut it. Vinegar is the solution. To achieve the perfect shine and remove any blockages from shower heads, fill a small plastic bag with vinegar, place it over the shower head and tie at the bag securely at the top. A hand-held shower head can be submerged in a bowl of vinegar, if preferred. Leave it for a few hours then remove, rinse with water and wipe down. It really is that easy. You can also spray neat vinegar onto shower doors, draining boards and taps. Just leave it for a few hours so it can work its magic before wiping it off. Find more bathroom cleaning hacks in our guide. If you have any mould and mildew in the bathroom or on your shower curtain, spray with neat vinegar, leave for an hour or so, then rinse. Read more on getting rid of mould in our dedicated guide. Soak your toothbrush heads in a mixture of vinegar and hot water to give them a good clean. Don’t forget to rinse them thoroughly before using! Find more ways to get rid of household germs in our guide. Spray a 50:50 solution of water and vinegar onto windows, mirrors and shower screens and wipe clean with a lint-free cleaning cloth. Simple! Discover all the best ways to clean windows in our full guide. We’ve all been there, particularly if you have children. Vinegar can really help remove unwanted marks. Simply apply neat to the stain and leave it to work for about 15 minutes, then blot the stain with a white cloth or paper towel (this way, you can actually see if the stain is lifting). Repeat the process, if necessary, then rinse using a wet cloth with a little washing-up liquid. See more on how to clean a carpet in our guide. Add 1 capful vinegar to the machine if you feel your laundry is looking a little dull (use the same cap you use for dispensing your detergent). Your colours will come out bolder and your whites whiter. Need to go back to basics? Here is how to do laundry. Combine 80 ml/1/3 cup white wine vinegar with 160 ml/2/3cup water. Apply the solution to the stain and blot with a clean cloth. Repeat this process until you’ve removed as much of the stain as possible, then wash as usual. Find more laundry hacks in our dedicated feature. Add 2 capfuls vinegar into the detergent compartment and run an empty hot cycle to freshen up your machine (use the same cap you use for dispensing your detergent). If it is really dirty, here is our guide to cleaning a washing machine.